It’s actually mu as in mu shu pork. When I was a kid, I ordered this at Chinese restaurants and my parents would exclaim, “Why do you order this? We make it at home much better!” They were right, but I loved the pancakes. I was also the one who ordered chicken strips at the seafood restaurant. My, how times have changed. I now refuse to order any Chinese dish that I can make at home. I usually go for those plates that make a fantastic mess to prepare… better their kitchen than mine. Mom’s homemade mu shu pork (and yes, she always used pork – no chicken, no beef, no tofu, no shrimp versions) included homemade pancakes – the mu shu shells. We called them bing and I have no idea if that is the proper Mandarin word or just some nickname my parents made up. I learned that one of the terms of affection they had for me translates into “stinky egg” and not “dearest daughter” as I had assumed, so you will forgive me if I am cautious about littering the page with what I *think* is accurate Mandarin terminology. 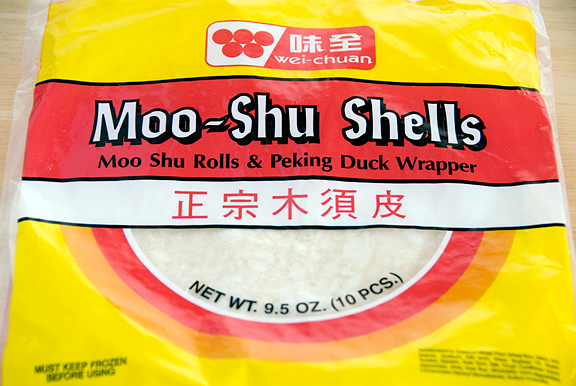 Make sure you get the mu shu shells and not egg roll wrappers. I’ve tried making the mu shu shells myself and wound up forgetting some crucial step and never got around to asking mom why my memory failed me and what the real process is. I’m sure that memory was overwritten with endless recollections of “JenJen, these SAT scores will not get you into MIT.” [Well they did, and I turned them down!] And imagine my horror and indignation when some 20 years ago, I caught the Frugal Gourmet telling folks they could substitute tortillas for the mu shu shells. Please don’t do that, and if you do, don’t tell me about it. Certainly, you can make it chicken, beef, shrimp. If you decide on vegetarian and use tofu, my preference is to use the dried tofu cakes, julienned. Better texture, in my opinion. You can also use napa cabbage instead of regular cabbage. It’s all very flexible. To cook the eggs, I beat them and make an egg sheet in the frying pan. It’s like a giant omelette that never gets filled or folded. Cook until done enough to flip and cook a little more. I cut the egg sheet into strips. Some folks will just cook scrambled eggs and chop it up into tiny bits in the frying pan. It’s really up to you. Next, I like to stir fry the cabbage and sprouts in a little oil with half of the green onions until they are wilted, but still a little crunchy. Then I’m ready to stir fry the pork. I heat a little oil in the pan and toss in the rest of the green onions and garlic. When it smells fragrant, then pork goes in and is cooked to just underdone. 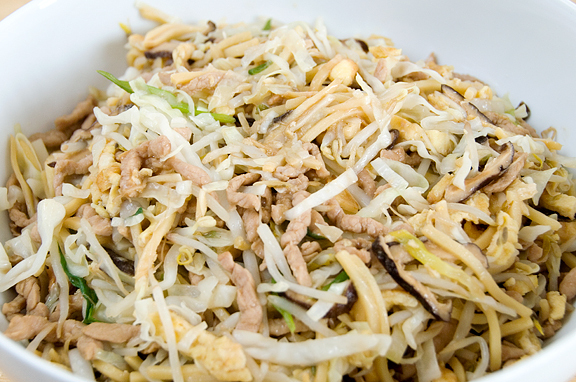 At this point, the bamboo shoots, mushrooms, cooked cabbage and sprouts, and egg sheet go in and everything is cooked into a glorious pile of stir-fried goodness. The shells usually have some instructions on the back of the package. Thing to remember is that they have almost zero thermal capacity, so you need to heat them and keep them warm somehow. I used to steam them, but if you nuke them in the microwave covered, they work just fine. Ah, okay – steaming is better. Just take care that they don’t get wet and soggy and nasty. A happy smear of a good hoisin sauce is a requirement. I typically avoid hoisin brands with more English than Chinese on the label. That’s just me. I can’t even read Chinese, but I recognize the labels. Go figure. Heat a tablespoon of vegetable oil in a large flat frying pan (a wok is gonna make you upset if you make an egg sheet) over medium high heat. When oil is hot, pour in the beaten eggs. Let the eggs set up until firm enough to flip as one sheet. Cook for a few more seconds and remove from heat to a chopping board. 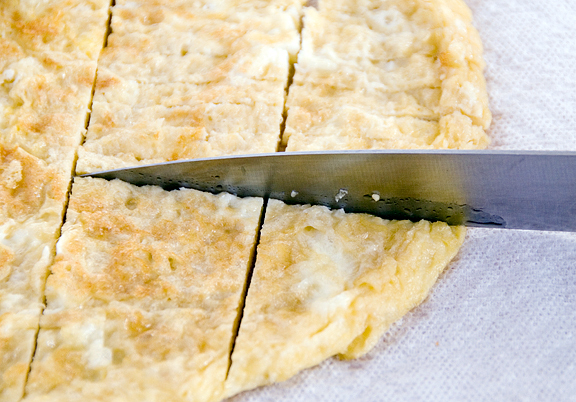 Slice the egg sheet into strips and set aside. Heat 2 tablespoons of oil in the same pan over high heat and add half of the green onions. Stir until the onions are sizzling for a minute. 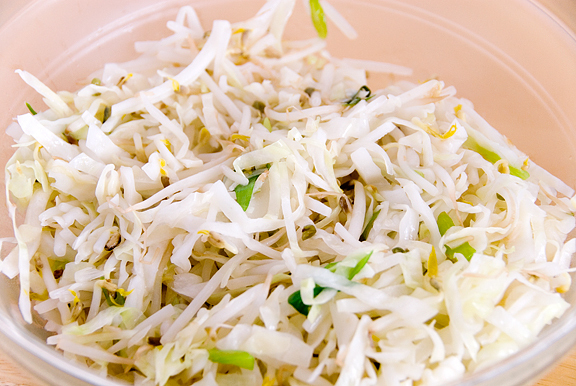 Add the cabbage and bean sprouts. Sauté until cabbage is wilted but still a little crunchy. Remove from heat and set aside in an extra bowl. Heat the remaining oil in the same pan over high heat and add the garlic and the rest of the green onions. Sauté until fragrant and add the pork. Stir fry until the pork is just cooked. 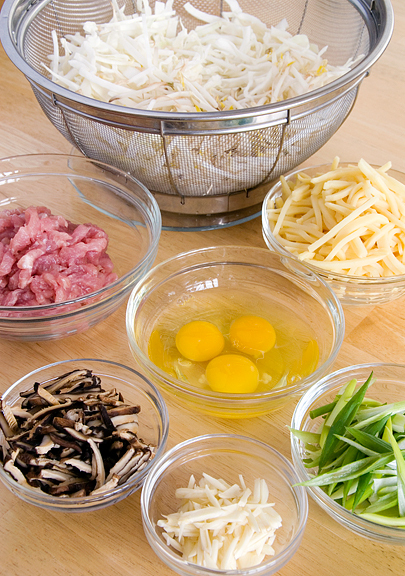 Add the Chinese mushrooms, bamboo shoots, cabbage, sprouts, and egg sheet. Stir fry for another few minutes. Heat the mu shu shells according to the instructions on the package. Serve each mu shu shell with a smear of hoisin sauce down the middle. Place several spoonfuls of mu shu on the shell and fold the sides in. That looks so good! I’m definitely going to try it. Thanks! Tortillas as a substitute…I think not! I am no expert, so I cannot contribute any more to the conversation than to say – gorgeous stuff! What a fresh and tempting photo. Hmm…looks like a Chinese burrito to me. But a tasty one! I always ordered this at Chinese restaurants since I didn’t know how to make it. In fact, I just had this last week at PF Chang’s and it was so not as good looking as yours. I vowed to try making it and now, it’s here on your blog. I’m so glad to see it! On a random note: Can anyone chop as nicely as this woman here?! Looks lovely! 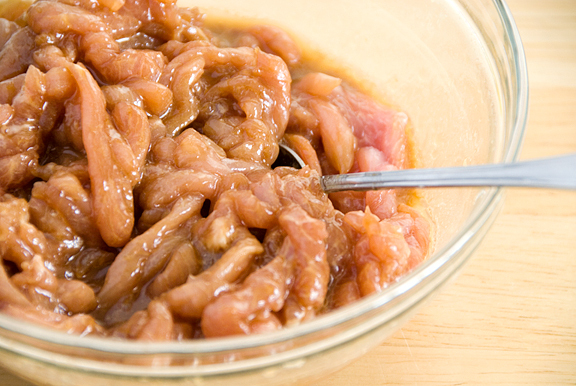 Does the pork have to marinate for a while in the soy sauce, sesame oil, and cornstarch mixture? I love Mu Shu Pork! This is what I’m making for dinner tonight, except with tofu. Oh, this is absolutely delicious.Speaking of sauce, I usually buy lee kum kee brand for chinese sauces- oyster sauce, hoisin sauce, black pepper sauce etc. Mu shu pork is a favourite of mine too, the first time I made it at home I was thrilled to learn it wasn’t actually hard to do! I love anything to do with wrapping and rolling. Delicious! great post! i love mu shu…i always order it with tofu b/c i’m veg…i can’t wait to try your recipe! I’ve been looking for something Asian to try with barbecue, and I think you’ve inspired me… Smoked Shu Pork! I love mu-shoo with plenty of plum sauce! Nice description of everything. Peabody – *hands on hips* My sentiments exactly! Christine – let me get back to you on the corn tortillas – pshaw! ha ha ha. I can only imagine what a lovely dish you’d make. Seems that anything coming out of your kitchen is a work of art, lady. As for my chopping… hee hee – I am in love with this ceramic knife my parents sent to me… *super* sharp. Every Asian girl should own one! Karen – nope, the pork doesn’t have to marinate at all, just mix and go! Marie – yay! It’s great veggie-style! Mandy – I recycled my jar, otherwise I would tell you the name brand I use. I’m okay on Lee Kum Kee sauces. I prefer a different brand of Hoisin, but their chili garlic paste or black bean garlic paste are not bad! Anh – that’s so funny! Come to think of it, I’m a fan of wrapping and rolling too. Queen bee – I haven’t made veg mu shu in a long time, but as long as you load the filling with good vegetables, it’s awesome. Kevin – you’re a machine, Kevin. You cook something new like every day! We love Mu Shu Pork around here. When my daughter was a toddler she used to call it “mooshy” pork, but she ate it. Yours looks way better than any I’ve had in a restaurant. I’ve got to try it! First time writing in. I made this tonight and it was really fantastic and very authentic although I didn’t have bamboo shoots. I actually used one of thos Joseph’s Lavash Square Bread in place of the mooshu pancakes but it was still fabulous. Is that just blasphemous?! Anyway, I absolutely love your blog, your courage and your spirit. You are amazing. I’m trying to get the mojo to make that beautiful baklava that you made recently. Yummmmy. SGCC – I hope you do try it! It’s pretty easy and soooo good :) Mooshy actually sounds closer to the Chinese way of saying it: mu shi ro. Tartelette – it’s the least I can do when you keep posting those mouth-watering desserts and pastries on your blog ;) I find Chinese cooking is a lot of that – lots of prep and then it all comes together in minutes of cooking. Sweet! I’ve been looking around for a good burrito recipe, thanks! I love your cooking instruction and your easy to follow recipes! 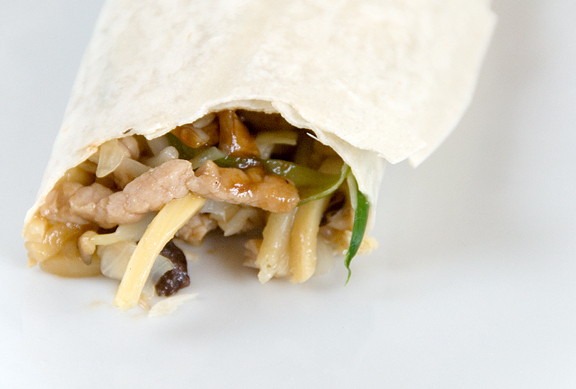 I also have lots of people commenting that this is like a “chinese burrito”, like you said! Adelina – you’re very welcome and thanks for dropping by. i think my friends and me will like it. That looks fabulous! Would you be able to ask your mother for the ‘bing’ (mu shu wrapper) recipe pretty please? Jenny – oh boy… getting a recipe from a Chinese mother… that’s hard to do. I might find one at some point, but probably not anytime soon. Sorry. 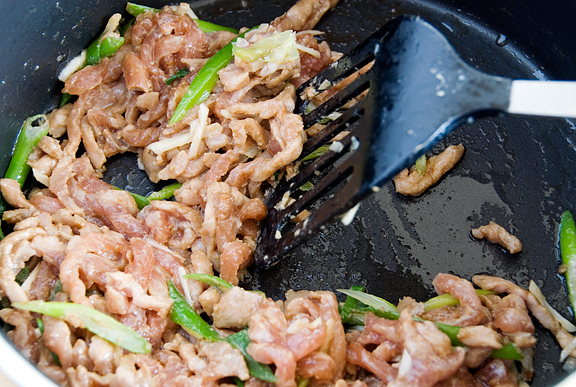 An interesting recipe for moo-shoo (mu-xu) pork. It has neither the moo (clouds ear), nor shoo (lily buds). Like your parents, when I make mu-xu pork, I make the bo-bing wrappers too. It doesn’t take too much time and they taste better than the commercial ones. Dave – thanks, I think. Wow, loved the mi fun last night, so tonight we are making the mu shu pork with rest of ingredients…..Thanks! I made this and it was great. I used rice paper wrappers like they use in Vietnamese food because I am allergic to wheat and so can’t do mu shu shells. They’re bigger around and thinner so you wrap it up more like a burrito. But it totally worked and made it a safe meal for me. And my wheat eating friends liked it too. Thanks for the recipe – Moved from NYC to New Orleans, and there is a serious lack of good Chinese food here… Learned several dishes (also learning to cook Thai, Japanese and Vietnamese – next attempt will be Ethiopian), but been missing my Mu Shu for over 3 years now! Anyway, as for the pancakes, Food network has a recipe from Emeril Lagossi that looks fairly easy. Now, I just have to find a source for plum sauce, and I am going to have a FEAST! UUuuuuUUUuuummm… Muuuuuuu Shuuuuuuuu! Hi – American expat in Beijing, and I was just informed that mu shu pork is a Chinese staple… previously, all that I recognized as an American was Kung Pow Chicken. That said – I tried it tonight in Beijing and it is a million miles from anything we would recognize in the states. 2. – Cucumbers, pork, egg, and black fungus – only. Oops! I ordered mu shu pork from my local Chinese take out last friday. It included 4 pancakes with the order, but after the 4 pancakes were used up, I still had a lot of mu shu pork left. So I went out and bought tortilla wraps to use up the rest. Now I used up all the mu shu pork, but still have 6 tortilla wraps that I don’t know what to do with. Oh, and my parents’ nickname for me when I was growing up tranlates to “little devil”. I, of course, didn’t know what it meant at the time. lol Love this recipe so much, laughing because this is the first recipe I came across that stated NOT TO SUBSTITUTE the wraps with tortillas LOL. that was the best indication for me that this was the right recipe. 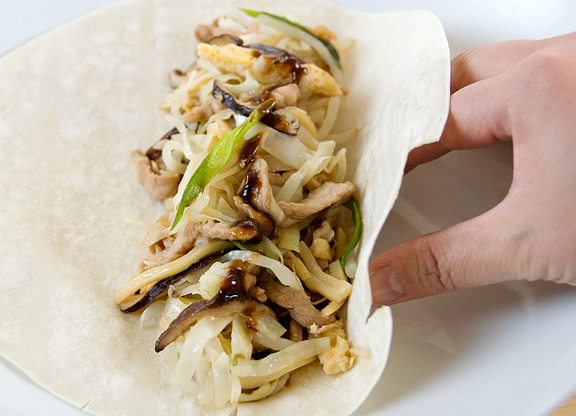 Anyone that suggests tortillas are a suitable substitute for moo shu wraps doesnt have the palate for food that I want to eat. THANK YOU for that. Tortillas are meant for beans and rice not vegis and rice. This is the recipe that drew me to your site and my mouth waters every time that I come to ogle all the yummy goodness you post. I currently live in Australia and have found it really hard to find Mu Shu shells out here. Any chance you could try to post the recipe to the best of your recollection for those of us that refuse to use tortillas? Many thanks and please keep up the beautiful pictures and the tasty recipes! The only thing is, I would never, ever use “vegetable oil,” which is highly processed, often using hexane and other chemicals to extract the oils, and is bleached, etc. Peanut oil is less toxic and has a high smoke point. Thank you for this recipe, I have been wanting to channeling my inner Asian and make this but the only thing that has held me back is the shells…now I have a name brand to hunt for. Since I live in Bodunk Tennessee and even our small city North of us does not have an Asian market do you know anywhere to buy these online? This is my must have dish when I eat Chinese, even if I get something else I get an order to go for the next day. And I agree pork is the best, and like you, I have seen some restaurants around here actually use a flour tortilla….those places are automatically off my list. Unfortunately that happens way too often around here so I always ask first. Thank you again. Ohhhh, mu shu pork, how I love you. This recipe brings back memories of eating at Yu Shan in Sunnyvale, CA every week when my mom went back to work. They didn’t serve it with Mandarin pancakes, though — they had these pita-like rolls, but rectangular, about 3″ x 4″, flaky and topped with sesame seeds IIRC. I’ve been googling on and off for a couple of years, trying to figure out what they were… no dice. I keep ending up with “Mu Shu Pork on a Hoagie Roll” and other such abominations. And Yu Shan is long gone now… alas. Thanks for this recipe — I’m going to try it this week. I’m so psyched that I found your website and have made lots of your Chinese dishes (much to my family’s delight) since a Christmas visit to my parents’ in St. Louis. My 1st-gen parents live a couple of miles from Chinatown in St. Louis, and we seem to eat our way through their favorite restaurants while I’m there. I live in small town Minnesota where the “Chinese” food is a complete joke. Leaving St. Louis and arriving back home leaves a complete void. Oh, I’m so thankful for you! Just yesterday, I followed your instructions for Mu Shu Shells at the request of my 17-yr-old wishing for Beijing Duck for her Birthday Meal. I’ve always had this on my list of dishes to try and replicate at home. It’s my second favorite, twice cooked pork being my first. Thanks for giving such great directions. I’m living in Norway and thrilled to see this recipe since Chinese food here is adapted very differently to American Chinese and mu shu is never on a menu, nor have I seen the pancakes.